SAN ANTONIO, TX — No. 1-seeded Villanova will aim to win its second NCAA Tournament national title in three years when it takes on third-seeded Michigan on Monday night at Alamodome in San Antonio. Game time for the national championship is set for 9:20 PM ET and will be televised and stream live on TBS. Villanova whipped fellow No. 1 seeded Kansas in its Final Four game on Saturday night, while Michigan rallied to top Loyola-Chicago 69-57 in the other Final Four encounter. While the Wildcats (35-4) are in their second national championship game in three seasons and seeking a second title in the three campaigns, the Wolverines (33-7) are making their first national championship game appearance since 2013. Both teams are also in good form entering the season finale. Villanova, which boasts the nation’s best offense with 86.8 points per game and is shooting just over 50-percent, is currently on a 10-game winning streak and beat the likes of West Virginia, Texas Tech and the Jayhawks during this run. 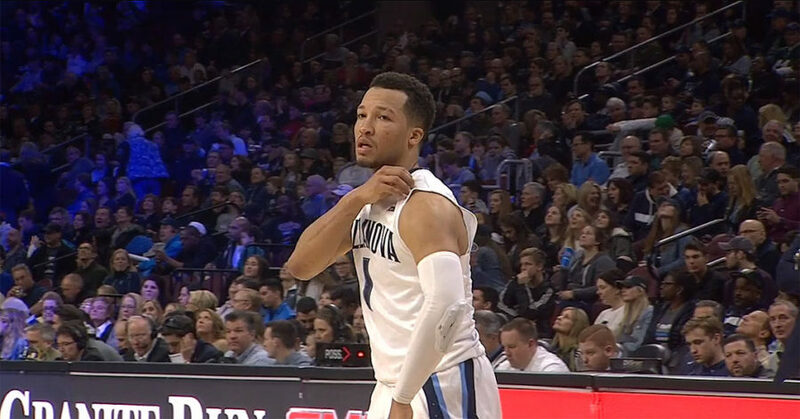 Jalen Brunson of Villanova during a college basketball game. “Obviously we’re very talented offensively,” said junior guards Jalen Brunson, who scored 18 points in the win over Kansas. Meanwhile, Michigan will carry an impressive 14-game winning streak into the national championship contest and is scoring almost 74 points per game and giving up close to 59 at the other end. “This team’s had no attention at all,” said Michigan head coach John Beilein. Moritz Wagner, who recorded a double-double with 24 points and 15 rebounds to help the Wolverines erased a 10-point deficit in the second half in the win over Loyola-Chicago, is expected to be a handful for Villanova on Monday night. Wagner, who is from Berlin, Germany, got noticed by idol and fellow countryman Dirk Nowitzki on Twitter, became only the third player and the first since 1983 to register at least 20 points and 15 rebounds in a national semifinal game. The 6-foot-11 junior joined NBA greats Larry Bird (1979) and Hakeem Olajuwon (1983). “Wow. If you put it like that, that’s probably cool,” Wagner told reporters after Saturday’s win.